DNA studies have shown that polar bears and brown bears have a common ancestry. The genetic split occurred about 150,000 years ago in the late Pleistocene just before the end of the Pleistocene glaciation known as the Ice Age. They evolved to meet the conditions of the Ice Age and they continue to adapt. In their present form as polar bears they have survived previous interglacials with temperatures greater than we have at present. And far from being endangered and under threat of extinction they continue to adapt their behaviour and to prosper. “The number of bears along the western shore of Hudson Bay, believed to be among the most threatened bear subpopulations, stands at 1,013 and could be even higher, according to the results of an aerial survey released Wednesday by the Government of Nunavut. That’s 66 per cent higher than estimates by other researchers who forecasted the numbers would fall to as low as 610 because of warming temperatures that melt ice faster and ruin bears’ ability to hunt. 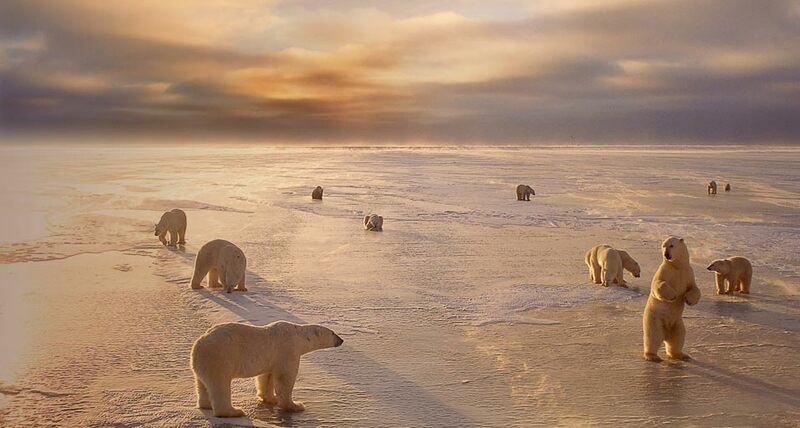 The Hudson Bay region, which straddles Nunavut and Manitoba, is critical because it’s considered a bellwether for how polar bears are doing elsewhere in the Arctic. In 2004, Environment Canada researchers concluded that the numbers in the region had dropped by 22 per cent since 1984, to 935. They also estimated that by 2011, the population would decrease to about 610. That sparked worldwide concern about the future of the bears and prompted the Canadian and American governments to introduce legislation to protect them. …. This entry was posted on April 6, 2012 at 8:23 am and is filed under Alarmism, Arctic, Canada, Wind power. You can follow any responses to this entry through the RSS 2.0 feed. Both comments and pings are currently closed.